“The public demands that we act,” U.S. Sen. John Cornyn, R-Texas, said at a bipartisan meeting Wednesday at the White House on gun violence. 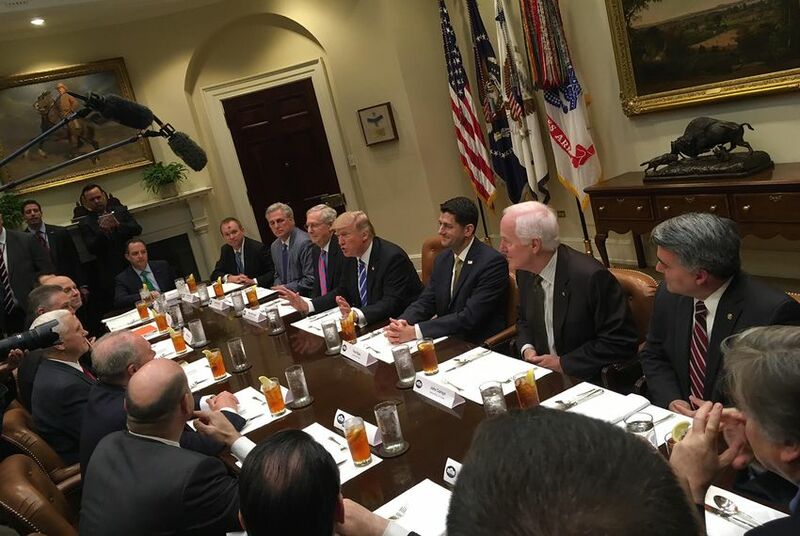 WASHINGTON – At a bipartisan White House meeting on gun violence Wednesday, President Donald Trump pressed Republican U.S. Sen. John Cornyn of Texas and other lawmakers to come together and create “one great piece of legislation” to address background checks on gun sales, in addition to other measures. Cornyn, alongside U.S. Sen. Chris Murphy, a Connecticut Democrat, has been pushing for a vote on his “Fix NICS” bill, which would hold government agencies accountable if they fail to upload individuals’ criminal histories to the FBI’s National Instant Criminal Background Check System. Forty-six senators have signed on to co-sponsor the bill, including 10 this week. Trump praised the bill, but added it “would be nice if we could add everything on to it,” referencing raising the age limit on purchasing an AR-15 rifle from 18 to 21, among other proposals. “Your bill is really good and really important, having to do with a certain aspect, but maybe we could make it much more comprehensive and have one bill instead of 15 different bills,” Trump told Cornyn. Congressional leaders have clashed over the "Fix NICS" proposal, with Senate Democrats arguing the legislation does not go far enough in addressing gun violence or problems with the background check system. “Rather than just passing one narrow bill and moving on, we Democrats intend to push our Republican colleagues to have a real debate on gun safety,” Senate Minority Leader Charles Schumer of New York told reporters Tuesday, according to Politico. Trump also repeatedly directed Cornyn and Murphy to work with two other senators prominent in the gun control debate: Republican Pat Toomey of Pennsylvania and Democrat Joe Manchin of West Virginia. The pair authored a 2013 bipartisan bill to expand background checks on gun sales. That measure failed in the Senate with 54 votes, but there have been calls for it to be revived following the shooting in Parkland, Florida. Senate Republican leadership has opposed marrying the Toomey-Manchin legislation with the Fix NICS bill, arguing that a narrower measure with broad bipartisan support is crucial to passing any legislation that addresses gun violence. Cornyn repeated that point Wednesday, telling Trump and other legislators gathered around the table that Congress should act to address what it can now.